A Russian Rockot (Rokot) launch vehicle has lofted three identical satellites for the European Space Agency (ESA) on Friday. Launch of the three Swarm spacecraft took place at 12:02 UTC from the Plesetsk Cosmodrome in Russia, ahead of their mission to map Earth’s magnetic field. The Rockot (or Rokot as is its official Russian name) is tailored to payloads requiring a performance of at least 1,950 kg for launches into Low Earth Orbit (LEO). The three-stage liquid fuelled rocket has dedicated launch facilities at Plesetsk Cosmodrome under the control of Eurockot. Rokot is a fully operational, three stage, liquid propellant Russian launch vehicle which is being offered commercially by Eurockot Launch Services for launches into low earth orbit. The German-Russian joint venture company was formed specifically to offer this vehicle commercially. 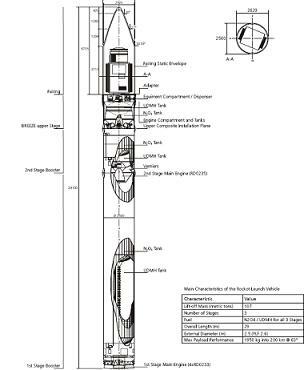 The Rokot launch vehicle uses the the SS-19/(RS-18) Stiletto ICBM for its first two stages. The Rokot second stage has an external diameter of 2.5 meters and a length of 3.9 metres. It contains a closed-cycle, turbopump-fed, fixed main engine designated RD-0235 and verniers designated RD-0236 for directional control –as listed in the 200 page vehicle overview presentation (L2). Separation of the first and second stages is a “hot separation” – due to the fact that the vernier engines are ignited just before the separation. The exhaust gases are diverted by special hatches within the first stage. After separation, the first stage is braked by retro rockets, then the second stage main engine is ignited. Like the first stage it contains a common bulkhead and a hot gas pressurization system. The Breeze-KM stage – which has now been adopted as the standard version of the third stage for the commercial version of Rockot – is a close derivative of the original Breeze-K stage flown during the first three Rokot flights. It comprises three main compartments which include the propulsion compartment, the hermetically sealed equipment compartment and the interstage compartment. To allow larger satellites to be accommodated and to reduce dynamic loads, structural changes to the Breeze-K stage were introduced. 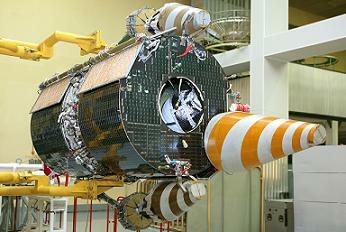 The Upper Stage completed its role in deploying the satellites after just over 90 minutes of flight. Swarm is ESA’s first constellation of satellites for Earth observation, with the trio riding to orbit on a tailor-made dispenser to ensure that the three separate simultaneously from the upper stage. The way the three satellites snugly fit inside the fairing also provided some guidelines into their design, because they had to be compact enough to all fit into the launcher fairing. 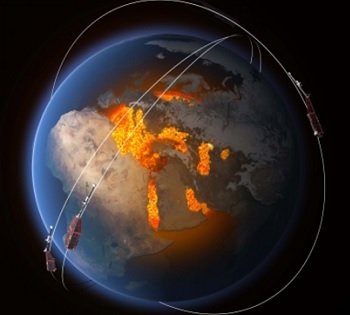 The German-built satellites are equipped with magnetic sensors that will identify and measure different magnetic signals that stem from Earth’s core, mantle, crust, oceans, ionosphere and magnetosphere – which together form our magnetic field. Swarm will be the fourth Earth Explorer mission in orbit, following GOCE, SMOS and CryoSat, launched in March 2009, November 2009, and April 2010 respectively. Each satellite is 9.1 m long (including a 4-m deployable boom), 1.5 m wide and 0.85 m high and weighed in at 473 kg at launch – including 106 kg of Freon propellant. (Images via ESA and L2).